The Model LF263AP is a direct acting, diaphragm actuated control pilot that automatically reduces a higher upstream (inlet) pressure to a constant downstream (outlet) pressure. It is normally held open by the force of the adjustable spring setting above the diaphragm. The pilot modulates towards a closed position when outlet pressure exceeds the spring setpoint, lowering the delivery pressure. It modulates towards an open position when the outlet pressure falls below the spring setpoint, increasing the delivery pressure. 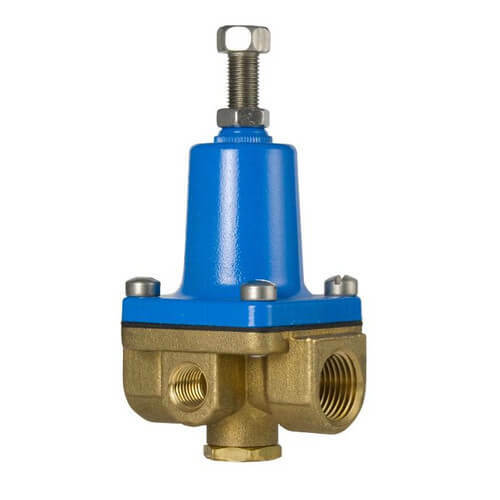 When a Model LF263AP is installed in the piping circuit of an Automatic Control Valve, its throttling action causes the Main Valve to throttle open or closed accordingly. Turning the adjustment screw clockwise raises the control setpoint, increasing valve outlet pressure. Turning the adjustment screw counterclockwise lowers the control setpoint, decreasing valve outlet pressure. The Model LF263AP is equipped with 1/2 in NPT inlet and outlet ports and a 1/4 in NPT side outlet port. The 1/4 in NPT side outlet port may be plugged or used as an outlet pressure gauge connection.